Campaigning for better policies and action for people with dyslexia is what drives us. But we need your help to do it. We were delighted when artist Jonathan Mitchell donated an original oil painting of our President Sir Jackie Stewart racing at the 1969 German Grand Prix in the Matra MS80. The painting was commissioned in co-operation with Sir Jackie Stewart in order to raise funds and awareness for Dyslexia Scotland. The original painting was sold at auction at the Goodwood Revival Weekend in Chichester on 14 September. This sale raised a phenomenal £5,000 for Dyslexia Scotland. 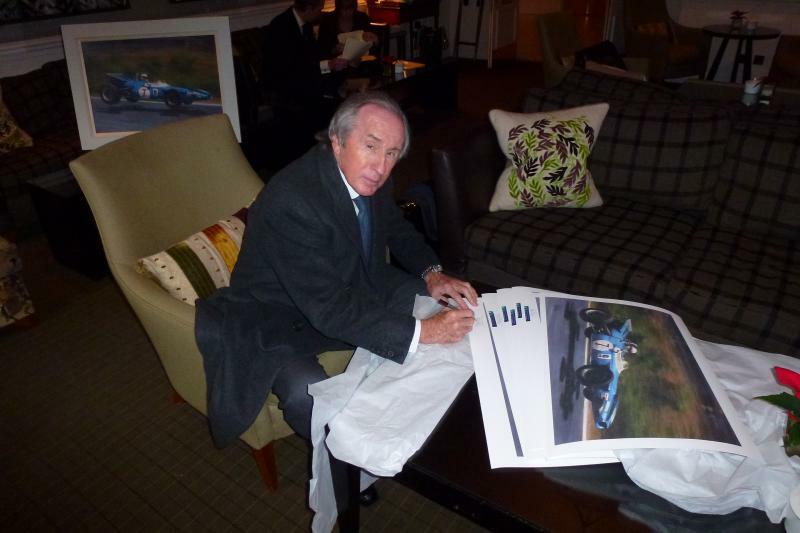 The limited edition autographed Sir Jackie Stewart prints are available to buy. Each print costs £250 (including mount). This amount comprises a payment of £150 for the actual print and a donation of £100 (suggested minimum) to Dyslexia Scotland - postage and packing is additional. Click here to order your own limited edition signed print. By ordering this way, you can add 25% Gift Aid to the donation to Dyslexia Scotland at no extra cost to you. Or click here to order directly from Canvas Art Gallery if you are not a UK taxpayer. Click here to see Sir Jackie signing the limited edition print. Click here to hear what Jonathan has to say about the project and to view his other work. Whether for business or for pleasure, enjoy making reservations at 1 of 4,866 restaurants via ChariTable Bookings in the knowledge that £1 net for every diner will be donated by the restaurant to a charity of your choice at absolutely no cost to you. Dyslexia Scotland is registered with ChariTable – find out more here. Dyslexia Scotland has recently partnered with Savoo.co.uk on a new and exciting fundraising project. Every time you use Savoo, you can donate​ to us by either searching online, or using their voucher codes and deals to save money. Watch this short video to find out more. Whether you are a member or not, you can help us raise awareness of dyslexia. To find out what you can do, click here. We’d like to say a sincere thank you to everyone who helps us. Supporting us in ways like this not only helps raise valuable funds but also increases awareness and understanding of dyslexia. If you’re interested in raising money for Dyslexia Scotland, or have ideas you’d like to share, we’d love you to get in touch. We acknowledge the support and funding from the Scottish Government for our work.